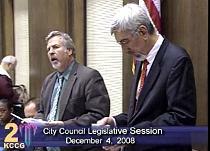 Councilman Ed Ford and Mayor Mark Funkhouser clash on a proposed settement to a discrimination suit involving the mayor's wife. Kansas City, MO – Fireworks erupted again in yesterday's city council meeting over the so-called "Mammygate" lawsuit filed by a city employee over alleged remarks by the mayor's wife. Forty minutes into an otherwise routine council meeting, Mayor Funkhouser announced that outside attorneys hired to defend him and his wife had come up with a settlement of the suit against the city and the council. The council could pay the plaintiff $135,000... and approve about another $40,000 in attorney's fees. Councilman Ed Ford responded that in return, the mayor should agree to withdraw his lawsuit challenging the ordinance that banished his wife from working in his office. The Mayor refused, and various council members pleaded that he come around to their point of view. After more than an hour and a half the council adjourned without accepting the mayor's proposal and without approving additional outside attorney fees.